COLUMBUS, OHIO (July 9, 2018) – A chance to make history and celebrate history serves as the backdrop for the 115th annual Trans-Mississippi Tournament which begins early Tuesday here at historic Brookside Country Club. The oldest non-USGA national amateur tournament in the country will be the first ever held in Ohio, and the first in more than 100 years (Memphis Country Club 1915) to be held east of the Mississippi River in the Eastern Time Zone. 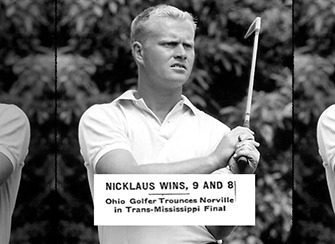 But the main reason for this week’s playing in new territory is to honor one of the greatest Trans-Miss champions of all time, Jack Nicklaus, who won his first Trans-Miss amateur title 60 years ago. He encouraged the 100-plus players, including some of the best amateurs in the U.S., to have fun this week and keep the ball in the fairway. On Monday, the players got their first look at Brookside course, the old school layout first built in 1928 by Charles Lorms. While cool in the morning, conditions in the afternoon were warm and humid with temperatures close to 90 degrees. But no rain allowed all the players to play 18 holes or practice as much as they wanted to before the start of the 72-hole stroke play event. The last two winners of the Trans-Miss, Will Zalatoris and Cameron Champ, have already turned professional and have played on the PGA Tour and various pro events. Trans-Mississippi Executive Director Rob Addington, who has overseen the organization over the last five years as part of his director’s duties with the Texas Golf Association, said his group has worked hard to upgrade the field back to the glory days with a winners list that includes major champions Nicklaus, Ben Crenshaw and George Archer. Further validating the event’s ascension, the 114th Trans-Miss Amateur at Prairie Dunes was dubbed 10th in the world and sixth in North America by the Scratch Players World Amateur Rankings. It’s the collection of strong players such as the one that will gather at Brookside that drives these high marks. In both 2016 at The Olympic Club and 2017 at Prairie Dunes, the Trans-Miss Amateur received WAGR’s “A” ranking for strength of field. In addition to the past two years’ elite ratings, WAGR also considered the 114th edition last summer as the seventh-best field of the 37 tournaments that received an equal ranking. Duke senior Alex Smalley, who won the 65th Sunnehanna Amateur in mid-June, is set to play at Brookside. He currently holds the 9th position in the Golfweek/AmateurGolf.com World Amateur Ranking, the highest entered amateur in the field this week. Ben Schlottman, who led Auburn to a semifinal finish in the NCAAs before winning the North & South Amateur at Pinehurst this summer, enters the week 77th in the world ranking. Also playing is LSU sophomore Jacob Bergeron, the 54th-ranked amateur in the world. He qualified for and played in the 118th U.S Open at Shinnecock Hills. So, too, did his college teammate Philip Barbaree, who carries the 110th spot in the rankings. Barbaree, an LSU junior, won the 2015 U.S. Junior Amateur and was runner-up that same summer at the 112th Trans-Miss Amateur at Flint Hills National. As befitting the status of the renewed amateur tournament, 2019 U.S. Walker Cup Captain Nathaniel Crosby is expected to be in attendance for Friday’s final round and be talking and watching players for possible inclusion for ’19 team. The Trans-Miss is one of the oldest and most storied golf tournaments in the United States. For 106 years the championship was played in a match play format. Past champions include Jack Nicklaus (1958 and 1959), Charles Coe (1947, 1949, 1952 and 1956), Deane Beman (1960), George Archer (1963), Ben Crenshaw (1972), Gary Koch (1973), Bob Tway (1978), Mark Brooks (1978) and other professional tour notables. In 1987 the championship was changed to a mid- amateur age requirement, and a senior division was also added. Starting in 2010, the Trans- Mississippi Championship, returned to its roots as an open amateur tournament, and immediately established itself as a "must-play" among top collegiate and mid-am players, while changing to a 72-hole stroke play format. The field size starts at 144 players from Trans- Mississippi Golf Association member clubs (or players receiving a special invitation from the Championship Committee). After 36 holes, a cut is made to the low 54 and ties who play the final two rounds.